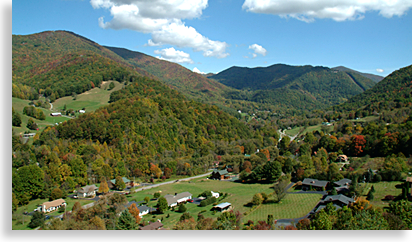 Engulfed within the towering boundary of 19 mountain peaks, all reaching well over 6,000 feet above sea level and cradled throughout deep green valleys and hidden away mountain coves, is Haywood County, North Carolina. This popular vacation destination and its ever-expanding communities of vacation homes and year-round residents has made Haywood County one of the most prestigious regions in all Western North Carolina. Haywood County’s 19 mountain peaks are the highest number of mountain peaks over 6,000 feet in any single county east of the Rocky Mountains and there is an obvious reason for that claim to fame. Flowing throughout the interior of the county’s northern, southern and eastern regions are sections of North Carolina’s Pisgah National Forest. North Carolina’s Nantahala National Forest borders the county to the southwest, while Tennessee’s Cherokee National Forest borders Haywood County along its northern border. Also, very noteworthy is Haywood County’s northwestern region, which contains a large section of the world famous Great Smoky Mountains National Park. Three National Forests and one National Park; all contained within the heartland of the Blue Ridge Mountains, all merging here in North Carolina’s Haywood County. Though some of those statistics make the county seem quite remote, lost within a land of mountains and forests, Haywood County is surprisingly a hub of towns, museums, outdoor recreation and historical sites with some of the most popular festivals and special events Western North Carolina has to offer. Held within this mountain region are the crossroads trails that have been used as popular trade routes since the earliest times for both Native American and Early American settlers, Today, this convenient geographical mountain hub of roadways have contributed significantly to the county’s growth and popularity. Four major highways, Interstate 40 and US Highways 19, 23 and 74, dissect the county moving travelers throughout this region of central Western North Carolina. Resorts, country clubs, a variety of shopping, galleries, fine dining, live entertainment and unique eateries along with a vast array of lodging which include inns, hotels, cabin rentals and bed and breakfasts these make up only a few of the county’s personal services. Haywood County is more than self-contained filling everyone’s needs, requirements and desires creating a perfect location for that special mountain getaway so many visitors long for. You know you’ve come to a special place when a rather remote mountain county like Haywood can offer up to 180 holes of golf on its numerous private and public fairways spread throughout the county. Haywood County’s towns and communities specialize in a quality and character all their own. The towns of Waynesville, Maggie Valley, Canton, Clyde and Hazelwood display individual personalities unlike any of its neighboring county counterparts. Haywood’s other mountain communities of Junaluska, Dellwood, Cove Creek, Jonathan, Hepco, Panther Creek, Fines Creek, Crabtree, Phillipsville, Beaverdam, Woodrow, Sunburst, Sounook and Cruso also offer a veritable sense of variety containing stately elegance, country charm and mountain hospitality. The mountain communities of Haywood County range from quaint little home spun spots in the middle of the road to premier upscale residential and golf club communities. When it comes to creature comforts Haywood County surely fits the bill. If you are looking for a great vacation destination, Haywood County is one of the most exceptional mountain counties of Western North Carolina. Throughout and neighboring Haywood County is the land of plenty when it comes to water sports. The county contains three modest size mountain lakes, numerous creeks, streams and the Pigeon River, all originating from its own private watershed that finds its headwaters in the high mountain barriers surrounding Haywood County. Accumulating all its waters, the Pigeon River traverses the county’s entire length, making its journey northward across Haywood County’s deep valleys, crossing the state line between the Upper Unaka Mountains and the Great Smoky Mountains, flowing ever prevailingly into the Great Tennessee River Valley. Visitors can literally touch the top of the sky in Haywood County along the southern and western edge of the county when you take to the highroad and travel the scenic Blue Ridge Parkway where it reaches its paved roadway overlook height of 6053 feet at Richland Balsam Overlook. The Great Smoky Mountains National Park’s eastern region dips into the northeastern corner of Haywood County. Here you can experience the popular and remote reaches of the Great Smoky Mountains in an area known as Cataloochee Valley. Camping, hiking, fishing horseback riding and mountain biking are some of the outdoor recreation the national park has to offer. Unlike the main paved route that dissects the center of the Smoky Mountains, access into this far eastern region of the national park in Haywood County is by way of a forestry road only. Its isolation and sole access road into this section of the national park proves to maintain the pristine and primitive state the Great Smoky Mountains stride to preserve. At the north end of Haywood County located on the outer eastern edge of the Smoky Mountains is Waterville Lake and the Harmon Den Wildlife Management Area, both are located in the Pisgah National Forest just outside the national park. These two outdoor recreation areas lie along the I-40 corridor that follows the winding path of the Pigeon River northward. In the southern end of the county is another section of the Pisgah National Forest where you can scale the mountains in the comfort of your vehicle along a local scenic byway. Following this route, you will ascend the steep mountain slopes along the waterways of the West Fork and East Fork of the Pigeon River to its very headwater as you travel along the Forest Heritage Scenic Byway. The full 79-mile scenic byway crosses the Blue Ridge Parkway at two separate locations along a tour thru southern Haywood County and northern Transylvania County. 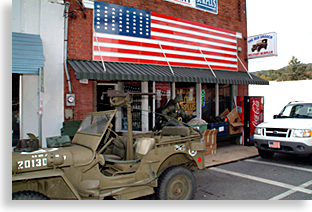 Here in Haywood County’s southern region of the Pisgah National you’ll find Cold Mountain, the inspiration of the popular novel and major Hollywood film. Shining Rock Wilderness is also located in this southern region providing what seems to be a limitless number of trails along the steep mountain slopes just below the northern edge of the sky-high Blue Ridge Parkway. Spring, summer and fall aren’t the only popular outdoors season celebrated in Haywood County. Winter brings life and excitement to these eastern United States Mountains, with skiers and snow boarders testing their skills with a love of slippery surfaces on the mountain slopes in the Cataloochee Ski Area just north of Maggie Valley. There’s so much to do in Haywood County throughout the year that one trip would only skim the surface of this vacation paradise. So, before we go any further or rather deeper into what Haywood County has to offer its guest and residents, the Highlander would like to share a little background history of this rugged heartland of the Blue Ridge and Smoky Mountains. In the year 1785, early settlers made their way into these deep reaches of the Blue Ridge Mountains and began settling along the Pigeon River after the Cherokee People were forced further west in 1783 due to a conflict involving 2,400 troops under the command of General Griffith Rutherford. Haywood County was originally founded in 1808, some thirty years before the infamous exodus of the Cherokee People along the Trail of Tears in 1838. The area was populated with mostly Revolutionary War veterans, traders of goods, land speculators and opportunist. 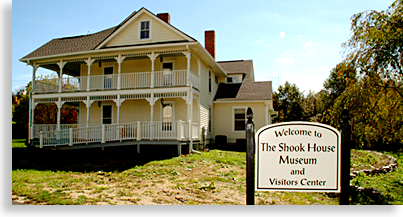 Jacob Shook was a Revolutionary War veteran who built the historical Shook House, which dates back to 1795 and is currently open to the public as a museum and visitor's center in the Haywood County town of Clyde. The Cataloochee Trail is an old Native American trail used by early settlers crossing the mountains of North Carolina into the Tennessee River Valley to the west. Bishop Francis Asbury 1745-1860, used the Cataloochee Trail often in and around 1810. Known to be calm and untiring in his efforts, Bishop Francis Asbury was considered to be "The Father of American Methodism" and foremost among early American circuit riders and colonist. You can find a monument dedicated to his faith driven works is located along the shores of beautiful Lake Junaluska on the grounds of the Southeastern Jurisdiction of the United Methodist Church and Conference Center in Haywood County. Though the majority of the Cherokee People were force out of the Blue Ridge, Smoky Mountain regions, a remnant of the Cherokee People, just so happen to exist on the outer western edge of Haywood County. 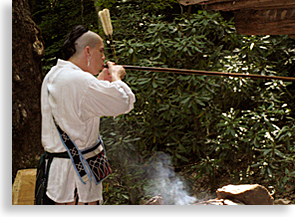 These Cherokee’s held a firm grip on their ancient homeland in a remote area on the other side of the mountain, just over the western ridge of Haywood County’s own Maggie Valley. This particular group of the Cherokee People is popularly known as the Eastern Band of the Cherokee. The Qualla (Cherokee) as their tribal clan is known, privately own the lands within the Qualla Boundary where the popular tourism town of Cherokee, North Carolina is located. This particular tribal clan bought a large tract of land with the help of a white settler after the land was made available for sale due to a treaty the Cherokee Nation and the United States government signed many years prior to the Indian Removal Act of the 1830’s. Because of their private ownership of the land, this particular group of Native Americans was not subject to the forced removal by the government of the United States. Only the Cherokee people which consisted of all the other Cherokee Nation’s tribal clans, who held a claim as a united single nation, were force to leave their native mountain homelands. This was due to what most Cherokee People believe was an illegal treaty signed by some and not all of the nation’s tribal leaders. The railroad and the mountain’s natural resources strongly contributed to the communities of Haywood County and brought financial growth the region in the late 1800’s and early 1900’s. 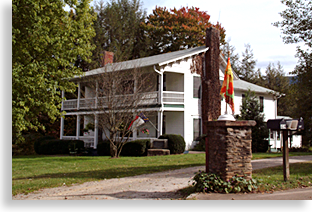 For a richer and fuller history of the white settlers and their lives in Haywood County, the county historical museum along with other local museums in the county offer a complete and fascinating look at this mountain region and the hardships the settlers endured paving a way for what Haywood County has become today. 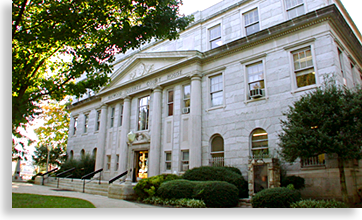 Prior to 1809 Haywood County was part of Buncombe County, home of the city of Asheville North Carolina. In March 1809, the county was officially named after a non-resident of this mountain region John Haywood, the state treasurer of North Carolina. The towns and communities of Haywood County are surprisingly numerous considering this area was once considered too isolated and hard to reach. Yet the county has defied the odds and has become one of the more populated counties in Western North Carolina. Its unique location offers an individual expression contained in a lifestyle that covers the spectrum, from mountain country charm to the more refined eloquence of a country club status. The largest town in Haywood County is respectively the county seat. Waynesville is located in the center of the county along highway 23/74 just southwest of Interstate 40. Waynesville is a growing bustling mountain town that is rapidly expanding due to its popularity and ideal central mountain location. All the while the county has maintained and refuses to let go of its quaint mountain charm. With the outer areas along the main 4-lane growing with popular chain stores, it’s the heart of the downtown-shopping district that remains true that charm. Arriving at the Old Courthouse you begin a journey thru time down main-street with its various displays of old-town architecture. This row of commerce offers a stroll along cobblestone walkways lined with art galleries, specialty shops, working studios and an array of fine dining and unique eateries. Adjoining the downtown district is the revitalized railroad district; this historic district has been named to the National Register of Historic Places. The old town atmosphere will draw you in and the hospitality, unique shops and cuisine will keep you in Waynesville the whole day-long. The cultural arts find its home here in Waynesville through the arts council and the Haywood Arts Regional Theater along with the summer Folkmoot USA Festival which has been named among the Southeast Tourism Society’s Top 20 Events. Throughout the entire town Waynesville, you’ll find and abundance of shopping dining and lodging to suit your every need. Festivals and special events keep the town hopping throughout the year. The Blue Ridge Highlander’s event calendar can help you plan your visit to Waynesville making the most of your valuable time well spent. Local residents, visitors and its peers have often referred to Waynesville, as the “perfect mountain community,” due to its new growth and old town charm. 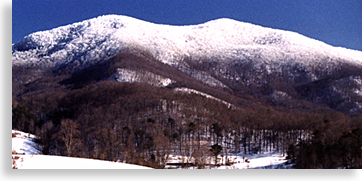 Its mountain landscape backdrop offers a uniqueness of grandeur with the Balsam Mountains to the south and west. The high ridge of the Balsam Mountains above Waynesville supports one of the premier section of the Blue Ridge Parkway, several northern overlooks along the Parkway look down onto Waynesville, views you’ll want to take in both day and night. The town of Maggie Valley lies to the northwest of Waynesville. It’s location, situated within a long valley surrounded by high mountains and hidden coves, seems almost isolated to most visitors of Haywood County. Appearances though are deceiving; Maggie Valley’s location lies along US 19 which is a main artery that traverses the Blue Ridge Mountains over some of the steepest mountains and deepest valley in Western North Carolina and North Georgia. This roadway has been considered an essential historical trade route, yet every mile of it seems to be just off the beaten path enabling a town like Maggie Valley to preserve it special mountain charm. When entering the city limits of Maggie Valley, US 19 becomes Soco Road, which cuts thru the center of this long valley, dissecting this elongate narrow town in half. No wide grid opportunity for growth here which makes Maggie Valley’s commercial district all accessible right in front of you, or rather to the left or right of your scenic drive thru Maggie Valley. If you’re looking for that special kind of country town with the big mountain heart you’ll find it in Maggie Valley. The Valley was named after Maggie, the young daughter of the town’s first postmaster and its namesake depicts its innocent southern mountain hospitality. You’ll be at home here if you’re aching for some of that “home cookin, toe tappin, heart poundin, and hee-haw kind of feeling.” Maggie Valley has its own Opry House and other theaters catering to the likes of many, with renowned entertainers performing throughout the year. Great places to eat and shop plus specialty and historic museums all geared toward family fun that will keep you busy when the music isn’t playing. Yet Maggie Valley is not all “country pickin.” What you’ll also find in the valley and along its narrow steep slopes are upscale neighborhoods, golf course and country clubs, plus the neighboring Cataloochee Ski Area. Lodging up and down Maggie Valley’s country boulevard varies to suit your personal style and taste with shops and eateries lining the way. Maggie Valley is so set on preserving its unique country image that you won’t find many chain or franchise type businesses; restaurants, lodging and other commercial establishment are predominantly privately owned offering a special taste and style of home spun country charm. At two central locations along Soco Road, you’ll find Maggie Valley’s newly established community mascot, a statue of the stately and noble North American Elk. These elk monuments on either side of the roadway commemorate the late 1990’s elk release that took place in the neighboring Chattahoochee Valley. Cataloochee Valley is located just over Maggie Valley’s northern mountain ridge in the southeastern section of the Great Smoky Mountains National Park. This special regional elk release re-established these magnificent horned creatures into a wilderness land just north of Maggie Valley which is only accessible by one, unpaved forestry road. The isolation of this region of the park offered a natural protective habitat for these beautiful animals to roam and replenish their herds. A journey into this remote region of the Great Smoky Mountains along its forestry road has brought visitors into contact with these great elks. If you choose to make this sight-seeing journey plan a full day trip, take plenty of water and pack a lunch, this area of the national parklands is very primitive. One thing Maggie Valley does have in common with its sister town of Waynesville is that it also lies below another section of the Blue Ridge Parkway. This section of the parkway is to the west, just above Maggie Valley and is accessible by taking Soco Road (US 19) west. When you reach, the parkway turn right and drive to the Lake Junaluska Overlook where you can view both Maggie Valley and Lake Junaluska, which lies in distance to the east. From Maggie Valley, Soco Road continues east along US 19 to the community of Dellwood, maintaining that Maggie Valley charm along the way, eventually blending with the picturesque community of Lake Junaluska. Upscale, lake front properties best describe the community of Lake Junaluska at first appearance. Yet the area has a long history of a special order. This area of Haywood County is home to the Southeastern Jurisdiction of the United Methodist Church and Conference Center making Lake Junaluska not only a destination of beauty but that of a spiritual nature as well. This conference center is situated along the western shore of the peaceful 200-acre lake with a backdrop of small watercraft gliding across the gentle sky blue lake waters of Lake Junaluska. A walking trail encircles the entire body of water if you’re up for a level stroll around the lake in comfortable shoes, quite a contrast to those primitive mountain trail hikes in the national forest. One notable feature that’s located along the northeastern shoreline near the conference center is a full standing replica of an ancient structure. The structure represents a type of Mediterranean Forum or type of pavilion, positioned ideally next to the lake shore within a tranquil setting. The neighborhoods along Lake Junaluska shoreline are rather unique. Rising up along the northern edge of the lake’s shoreline, are neighborhoods that intermingle with older classic and stately homes that you would find in larger metropolitan areas along with newer architecture that you would find in upscale 21st century developments. Also, located in the Lake Junaluska community is the Corneille Bryan Native Garden, a quiet sanctuary containing native wildflowers and foliage. Adjoining this lake community is Lake Junaluska Assembly Golf Course containing 18 of the presently numbered 180-holes of golf you’ll find throughout Haywood County. Lake Junaluska was named after Chief Junaluska, who lived with his people in the Snowbird Mountains in far Western North Carolina. A statue of the noble Chief Junaluska, along with other plaques commemorating the founders and influential leaders of the Southeastern Jurisdiction of the United Methodist Church, are located near the chief’s statue, next to the center’s lake-shore auditorium. Chief Junaluska was a Cherokee chief whose bravery was established during the battle of Horseshoe Bend. Roughly 500 Cherokee warriors united and fought under the command of General Andrew Jackson (prior to his presidency) and his men in an offensive move against a large band of warriors who were tribal members of the Creek Nation. This particular tribe or clan of the Creek, was known as the “Red Sticks.” The Red Sticks fought Jackson’s command to a standoff, threatening the outcome of the engagement until Chief Junaluska and a group of Cherokee braves committed a heroic and dangerous act that turned the tide of the battle in favor of Andrew Jackson and his entire command. Legend has it that Junaluska is also credited for saving Jackson's life during the battle of Horseshoe Bend, but later regretted his act of bravery when Jackson became President Andrew Jackson. The Haywood County towns of Canton and Clyde are located to the south of Interstate 40 along the banks of the Pigeon River and are likely the oldest existing communities in Haywood County. As the second largest town in Haywood County, Canton’s downtown area is an impressive example of classic turn of the 20th century Architecture. Several square blocks make up Canton’s historic downtown district. An enjoyable “walk-about” experience for those who enjoy ornate structures and unique out of the way shops and eateries. Renovation plans have been going on in Canton’s historical district with many building complete while some others are in the painstaking process of reconstruction. Witnessing these structures being restored is like watching history come alive, all the while maintaining the charm of its prestigious heritage. The town of Canton is located on the Pigeon River and holds significant historical value to the county of Haywood. Two historical points of interest in downtown Canton are the recently restored Colonial Theater and the Canton Historical Museum, which are continently located just across the street from one another. Today the old theater plays hosts to concerts, plays and live readings all preformed on its historical vintage stage. The Blue Ridge Paper Mill, located on the northern edge of Canton historical district is one of the oldest and continuously operating paper mills in the United States. The surrounding mountain forest of Haywood County and large local labor pool contributed to the financial prominence of this mountain mill town with its ideal location along the rail line and the banks of the Pigeon River. Several local buildings in the historic district are decorated with hand-painted murals depicting the history and development of downtown of Canton. The artistic warmth of these murals offer a touch to the senses, a link to a time and setting that’s more original and self-relying to this mountainous river valley. The town of Clyde is still a small town today, the community lies between the city limits of Waynesville to the west and Canton to the east. Today the town of Clyde seems like nothing more than a whistle stop between its neighboring towns. Established as an early settlement Clyde is home to the historical Shook House, which dates back to 1795. 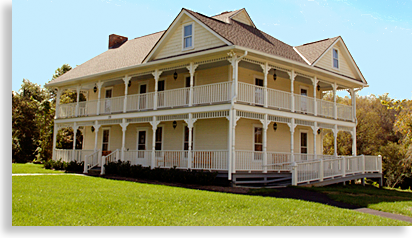 Jacob Shook was a Revolutionary War veteran who built the Shook House to act most likely as inn due to its large-scale size during this early time in mountain history. Today other than the obvious advanced population and main roadways bordering the northern and central parts of Clyde, the town seems to have changed very little in the last 100 years or longer. The town of Clyde has more of a community feel to it than the older established downtown district like Waynesville and Canton. The town grew in population when the railroad arrives, the majority of its residents likely acted as a job pool for neighboring towns and local industry. Yet this small town has quite a character all its own. The old structures seem to cling to its former glory, while the Old Grouch Military Surplus Store is an amusing throw back to a former time almost forgotten. The towns of Canton and Clyde have played import roles in the ongoing and early history of Haywood County, with local mountain folks contributing to the ongoing success of the county and its history. A personal visit to these two communities will reveal the interesting yet worthy character of Haywood County. Located throughout Haywood County’s outer regions are its local mountain communities, some being no bigger than a wide spot in the road. Many of these out of the way locations offer services and recreation opportunities to visitors and local residents alike. Here you will find small galleries, restaurants, cabin rentals and bed and breakfasts. Some of the “old timers” still live in these areas having called Haywood County home for generations. Their modest historical homesteads dot the countryside maintaining a character that is unique to a past that’s almost all but forgotten. Their pride and affections for their ancestry and the hard lives they lived are shown through the customs and traditions, held within a landscape where no frills were commonplace. You can read the history of their lives in the lines of their dear old faces, like the rings of the great Chestnut tree, once kings of the Blue Ridge Mountain forest. Here in these outer regions of the county, outfitters provide the recreational services to those looking for that great outdoors experience. Outfitters offer rafting trips, fishing tackle, supplies and guided trips to favorite fishing spots. Campgrounds and RV Parks keep those true-blue mountain lovers out in the backcountry. Horseback riding and rentals for mountain biking offer sit down views of forested trails. Haywood County’s backyard is a lost paradise that provides those special experiences for folks looking to get out into the wonders of the natural world. A world of mountain escape with miles upon miles of hiking trails, beautiful and mysterious waterfalls, and quiet fishing spots, all set aside for that chance to commune with Mother Nature amongst her array of flora and fauna. An experience in adventure awaits you, an obsessed dream of what lies out there deep within those lost coves, hidden along the high mountain slopes. If roughing it in the wild doesn’t completely suit your fancy, you can golf in the fresh mountain air amongst Haywood County 180 challenging holes on public courses or private clubs as guest of a friend. Ladies can “shop till you drop,” throughout the county’s many unique stores and commercial outlets. 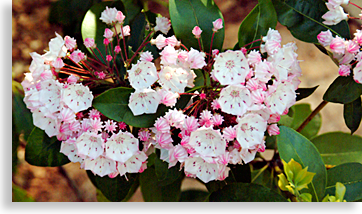 Looking for a quiet relaxing stroll amongst fauna and flora you might want to visit the Rhododendron Garden and Arboretum at Haywood Community College. This 1/3 of a mile walk within the confines of the 80-acre Haywood Community College will dazzle you with a festival of color including 75 varieties of rhododendron beginning in April. Following the rhododendron season, wildflowers and cultivars take center stage in the College Campus Arboretum’s living laboratory designed purposely as a natural forested trail. The Highlander does recommend that you make sure you don’t overdo it and take time to kick back, relax and enjoy the subtle beauty of Haywood County. Rest and recreation do go hand in hand, restoring your spirit with some quiet personal time of your very own, that’s why you came to the mountains to getaway and rejuvenate. With so much to do in Haywood County you’ll have to visit this high country often to discover for yourself that one visit, cannot take in all the benefits of this grand mountain setting.